How To Get There: Take the left fork off County Road 162 to Hancock. About 3 miles in, a sign is posted showing Mary Murphy Mine - 1 mile. Turn left up this road. Difficulty: The road is rocky and steep and 4 wheel drive is strongly recommended, although non-4 wheel drive, high clearance vehicles have made the trip successfully to the first site. Access to Pomeroy Lakes cannot be negotiated without 4 wheel drive. 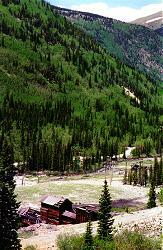 Private Property & Responsible Recreation: Mary Murphy Mine & much of the surrounding area is on Private Property. Venturing off of public roads and lands onto private land is trespassing. The surrounding mountains have miles of underground tunnels and shafts. The area is dangerous and a once safe and stable area can suddenly collapse. The buildings also are in various state of decay and are also unsafe. Obey any posted signs, travel & recreate responsibly, and always tread lightly. "There was two prospectors on Cottonwood Gulch named Murphy. One of them his wife's name was Mary, the other one's wife was Jennie. And they had found the two richest mines that was ever found in Cottonwood Gulch. These are two of the mines that I claim were fed from the crater I wanted to drive a tunnel into if the Irish American deal went through - that the Holts broke up - and that bust up caused me to leave the mountains and never got back until silver went down. Johnny Murphy left his brother in charge of both prospects while he went East for his wife and the best mine is named after. The brother was got drunk and got beat out of both mines for a trifle. When Johnny Murphy came there his brother was laying in the back room of a saloon with several cuts of a knife in him. Doctor Wright a old mountain doctor who took off a man's arm with pocket knife and a hand saw got the Mary Murphy Mine cheap off the party who beat the Murphy's out of it and sold it for $7,000.00. Before I left there the Mary Murphy had ten levels in it and showed (shored?) it up a 1,000 deep and $8,000,000.00 in sight and sold for $10,000,000.00. The Jennie Mack was worth two million. Before I left there Mary Murphy, Johnny's wife, was working in a hotel in Pueblo washing dishes..."